Slow PC’s are a common occurrence and there are a million things that can bring your machine to a crawl. While some folks can get by with an underpowered computer it’s something gamers cannot abide. High-end graphics card is one way to spice things up although upgrading your RAM is a quick way to give your rig a big boost. Finding the best RAM for gaming, however, is easier said than done. RAM is short for Random Access Memory and to say it’s an integral part of your PC would be an understatement. These little components help to keep things running smoothly by quickly storing and accessing data as you need it. That includes opening programs or dozens of tabs in your web browser along with handling your favorite FPS game or MMORPG. Graphics programs and high-end games require far more resources than a web page, so the more, the better if you plan on gaming. As long as you follow these tips, you will find yourself at the head of the pack instead of lagging behind your teammates when tearing through maps online. RAM capacity refers to the size of the modules and is directly tied to the types of games you want to play. The amount of slots on your motherboard dictates how much RAM your system can take, and what type of configuration you’ll need. Some may prefer four 4GB sticks while others may want to go with two 8GB modules to hit the magical 16GB mark. That is widely considered standard for most gamers, but underwhelming in professional rigs. This is also where the “system requirements” factor in. Consumers that don’t want to get too technical simply need to check the system requirements for the game they want to play. Games will have a minimum requirement along with the company’s recommended requirements. Bigger is better with RAM, so opt for the maximum if it’s within your budget and your machine can handle it. At the moment, there are two “main” types of RAM with SRAM and DRAM. For beginners, this is where things can get a little confusing depending on your current setup. Our guide to the best RAM for gaming will break down the differences, and explain the DDR system as well. DDR – DDR stands for Double Data Rate Random Access Memory and is another thing to consider. If you have an older PC that was made before 2010, you may require DDR1 or DDR2 RAM. Newer systems work with DDR3 and DDR4, which is the newest and fastest style. SRAM – Whenever you see the term SRAM, it means Static Random Access Memory. As it’s static, it is faster than other types of RAM and provides quicker access to data. It is also more expensive than your next choice which is called DRAM. DRAM – DRAM, or Dynamic Random Access Memory, is a more affordable option when it’s time to upgrade and generally the most common way to go. The access time is 60 nanoseconds compared to around 10 for SRAM, and it requires a steady stream of power. For what seemed like ages, gamers used DDR3, and it’s still a very popular option today. DDR4 quickly became standard with serious gamers, however, especially those running the X99 platform. If you have a compatible system, DDR4 is obviously going to be your best bet. In a nutshell, DDR4 is faster and operates at a lower voltage than DDR3. The lower wattage may not make much difference to the casual gamer, but the speed will. DDR3 starts at 800 MT/s and peaks at around 2100. DDR4 on the other hand “starts” at 2133MHz and skyrockets from there. On the flipside, all that speed can increase latency although it may not matter depending on your setup. Frequency is measured in MHz and is essentially how much data you can transfer to and from the RAM. The higher the frequency, the more bandwidth you’ll have to transfer data. It is an important area to pay attention to when choosing the best RAM for gaming as a few extra bucks could make a big difference. While frequency and bandwidth are two areas of importance, the same can be said for RAM timings. Timing is laid out as a series of numbers like 16-18-18-35, and each number represents a different function. If you are interested in what tRP means or want to know what the first digit represents, this article explains it nicely. Ballistix is a series of RAM modules produced by fan-favorite Micron. The Ballistix Sport LT’s are good looking sticks that are easy to install – even for beginners. While budget-friendly, you will be impressed by the performance they bring to your machine. The Ballistix Sport LT is geared towards gamers on a budget. They are of the DDR4 variety with speeds starting at 2400 MT/s on the base model and going up to 2600 MT/s for the PC4-21300. As you would expect, both are 288-pin modules. Micron slapped a slick heat spreader on these modules, and there are three options to choose from with Gray, Red, and White. Each has a camo pattern and sports the XMP 2.0 profile as well. The 8GB modules come in single packs or doubled up from 4GB all the way up to 16GBx4 depending on your needs. Corsair’s Vengeance lineup is just as colorful as the Ballistix, and nobody can argue with their performance. These DDR4 modules will make your PC fly and help keep you in the action long after others have sticks have failed. Like most companies, Corsair is going to give you options when it comes to the Vengeance LPX. The top option in our eyes is the 16GB set (8GB x 2) which has a frequency of 3000MHz. The heat spreader is made from anodized aluminum regardless of the size which helps to keep the heat down during those long gaming sessions. While there’s a lot to like about these modules, they are pricey compared to others in the same range. That’s due to the overall quality and tech specs, so the negative is really a positive in a sense. The LPX RAM modules are available in five different colors with Black, Grey, Red, White, and Blue. Kingston is a name consumers know and trust in the storage world from SD cards to modules. 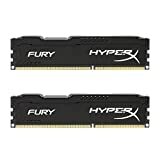 The Kingston HyperX FURY is our first option from the company, and one to seriously consider if you need an 8GB module that won’t break the bank. One of the first things that stands out with the FURY is its operating voltage. It’s extremely low at 1.2 volts, and it’s a plug-and-play module to boot. It will be easy for beginners as it comes dialed in to the proper speed out of the box. A few tech specs of interest include fly-by topology, LPASR, automatic overclocking, and a lifetime warranty with excellent technical support. If you want to color code your RAM, you’ll be pleased to know Kingston has made the HyperX FURY available in Black, Red or White. The modules themselves run from 4GB single sticks up to 64GB configurations. RAM doesn’t have to be bland and boring, and it certainly doesn’t break the bank anymore. If you’ve got a case that shows off the inside of your rig, the CORSAIR Vengeance RGB PRO should be at the top of your shopping list. These memory sticks are optimized for overclockers and feature anodized aluminum heat spreader coolers. The DDR4 modules support XMP 2.0, are easy to install and very easy on the eyes. That’s due to CORSAIR’s RGB lighting system and their iCUE software. Speeds vary depending on the style you choose, but start at 2,666MHz and top out at 4,266MHz. 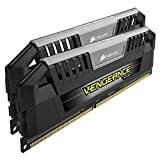 As we tend to have the “more is better” attitude when it comes to hardware, we went with the 2x8GB configuration of the CORSAIR Vengeance RGB PRO. That said, several other options are available including single 8GB memory sticks and quad 16GB modules. All are available with your choice of a black or white body. 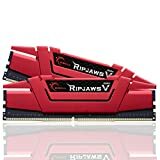 G.Skill may not have the name recognition of a company like Corsair, but it would be a mistake to disregard the Ripjaws V series. 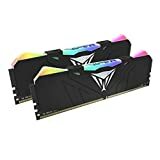 These sticks are compatible with a wide range of systems and are widely regarded as some of the best DDR4 RAM kits currently on the market. This particular set comes with two 8GB 288-pin DDR4 modules per pack. That’s enough to give your tired rig a big boost, and ideal to work alongside the best CPUs for gaming. The speed is listed at 2400 with Cas Latency 15 Timing set to 15-15-15-35. It’s low voltage as well at 1.2V and sports a standard heat spreader to help keep the temperature down. If you want to keep things simple and know what you need, it’s hard to go wrong with the G. Skill Ripjaws V Series. There are not as many options available as you’ll find with other models, but they perform as advertised and are well worth your time. For some gamers, RGB lighting is the only way to go, and there are a lot of options to choose from when you’re dealing with memory sticks. The Patriot Viper Gaming RGB series is one of our favorites, and it has a unique style that will stand out in your case. These memory sticks live up to their namesake as there’s a viper head on the front with glowing eyes. The RGB system extends to the top as well where a “fang” arises on each corner. It’s unique, and there are 5 RGB zones in all. The 16GB (2x8GB) configuration ranges from 2,666MHz to 4,133MHz depending on your preference or needs. This good looking module is available in white or black with XMP 2.0 support and a limited lifetime warranty. It’s a bit more expensive than similar RGB modules, but well worth it if you want something colorful and different! Our second RGB system from CORSAIR is a little different from our first choice. The Dominator Platinum lineup are premium sticks geared towards gamers that want a colorful, and informative solution for their PC case. The highlights of the Dominator Platinum memory sticks are the speed and lighting. This series is available in speeds up to 4,800MHz and are hand-sorted and screened with a 10-layer PCB. The RGB system makes use of 12 ultra-bright Capellix LEDs which can be customized in iCUE to give you the lowdown on temperatures and other ranges. These memory sticks are in the premium class, so they aren’t cheap, but perform as advertised. The TridentZ RBG shares a few similarities with the Ripjaws V as both are DDR4 RAM and built for gaming. That’s where the similarities end however as the Trident lineup is a more colorful option and a nice alternative to the Vengeance RGB. As the name implies, these sticks are from the Trident lineup, so they come with the popular heat spreader from the Z. It also has an RGB light bar across the top which allows you to set the lighting anyway you want. There are countless options to choose from when you factor in the software, and the performance is just as solid as you’d expect. If signal interference has kept you on the fence about going RGB, you’ll be pleased to know it will not be an issue with these modules. As for the technical specifications, the speed of this RAM is listed at 3200MHz, and the voltage is set to 1.35 volts. They come two per pack in 8GB sticks with timing set to 16-18-18-38. 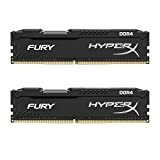 HyperX always tends to make an appearance on any “best of” list and gaming RAM is no different. The Predator DDR4 kit made the cut thanks to a subtle RGB lighting setup and the fact these modules support “extreme” overclocking if you are in need of speed. These high-performance DDR4 kits are XMP-ready if you sport one of Intel’s current chips. An aluminum heat spreader gives the module a mean look while handling the heat. The RGB comes courtesy of infrared technology which allows you to sync things up sans cables – provided you have the proper board. Otherwise, you’ll get a wave effect so you’ll want to check the compatibility with this one. Performance is just as good as you’d expect from Kingston, and you can choose from a wide variety of speeds with the HyperX Predator RGB as well. You can pick this one up in configurations ranging from a single 8GB stick to an 8x16GB combo, but the RGB range is limited to 2,933MHz – 4,000MHz. You can’t talk about the best RAM for gaming in the DDR3 class without mentioning Corsair. This kit comes from their Vengeance lineup but is from their PRO series. That’s a good thing if you need high speeds and don’t mind a higher voltage. These sticks come in a dual channel configuration with two 8GB DDR3 RAM modules set at 1.65 volts. The “tested” latency clocks in at 11-13-13-31 while the speed is listed at 2400MHz. It’s fast, and definitely in the PRO class from a specs standpoint. While this aggressive little 240-pin kit comes with a limited lifetime warranty, gold and black are the only colors currently available in this configuration. The eight-layer PCB and heat spreader make it an ideal choice for overclockers. Gaming motherboards don’t have to have DDR4 capabilities as DDR3 sticks are still going strong. Kingston realized that when they produced this 8GB kit from their HyperX FURY line. It’s from the same family as their DDR4 module but built for boards that can’t handle newer sticks. Like its sibling, the HyperX FURY DDR3 RAM is plug-and-play with an automatic overclocking feature. You won’t need to tinker around in the BIOS settings, which makes it ideal for beginners in need of speed. Our top choice clocks in at 1600MHz, but there are lower and higher speeds available from 1333MHz to 1866MHz. There are also lower voltage models that dip below 1.35 volts as well. You can pick up this kit in 8GB of 16GB configurations or in single sticks of 4GB or 8GB. It comes with a lifetime warranty while the color options include Black, Blue, Red, and White. Ballistix Sport RAM is another great choice if you are on a DDR3 system and need 240-pin sticks. They aren’t quite as fancy as the Sport LT, but still have all the features fans have come to expect from the company. From the integrated aluminum heat spreader to the XMP profile, this module is as solid as they come. It has a speed of 1600MHz and can handle quad channels as long as your system is up to snuff. It is unbuffered as well with timing set at 9-9-9-24. Like most kits, you’ll get to choose the size to suit your needs although you will not get to select a color this time around. Options include sticks 4GB or 8GB in size or kits ranging from 8GB kits up to 32GB kits with eight 4GB modules.